Photos for the day: (1) Asian bear. (2) Panda enjoying breakfast. (3) Brent with Josh, Rachel & cousin Hu Di. Today is a wonderful day. We went the Yunnan wild animal park this morning. In the zoo, at first we saw three bears. They stood up wanted to be fed, but it's a pity we had no food. Then we took the electrical car because we wanted to get the panda garden as soon as possible. On the way, we saw some deer, giraffes, ostriches and camels. Our first stop was the Lake of swan. There were a lot of swans and white crane on the lake. I also saw another kind of bird with long legs and a big beak, but I do not know their name. Then we got to the grassland, and the pandas. The first one looks plump and cute, then another panda named DiDi came out .It looks lovely, especially when it grabs a bamboo and eats .When I saw some staff chase pandas onto a platform and make the tourists take a picture with them in order to earn money, I felt a little sad. I think we should give the pandas a free space because they are our friends. After that, we saw other three smaller pandas.They are very active keep rolling and play with each other. We took a lot of pictures of them. It's my first time to be with panda so close. Before, I saw pandas through glass and pandas always sleep on the ground. In my impression, the pandas are lazy bones. But today I saw a different picture of panda. We were happy to be close to these lovely animals. The last stop was the park of peacocks. In there, we saw all kinds of peacocks. They are all very beautiful. At half past 12 we left for the hotel. Today is the last day of your staying here. I felt very lucky that I had a chance to spend some time with you. I had learned something from each of you, especially Carole and Josh. I hope you will have a good journey home. I will miss you. "If you think in terms of a year, plant a seed; if in terms of a year, plant trees; if in terms of a hundred years, teach the people." Photos for the day: (1) Example of the certificates received by students completing the 3-weeks of training. (2) The volunteers sing "If I Had a Hammer" at the closing ceremony. I believe we are all feeling spent but satisfied, here at the end of the three week program. Two more rides today to school on the bus driven by Mr. Qui: a last morning class, and then the afternoon Celebration Ceremony and Sharing with all 70 of us in the Teacher Training Program. Corrine's and my class engaged themselves in "Twenty Questions" and a "Dear Abby" kind of activity. How responsive and lively the students are! Ours brought in orange drinks, longan and lichees, peanuts and sunflower seeds for a mini-party at one of our breaks today. Outside in the Quadrangle we folk danced with another class. Then we returned to the classroom for a review of "Miss Mary Mack" and "The Noble Duke of York." For a quiet Finale, Corinne re-read to them a simple and charming book about "what is a friend?" Riding the bus in the afternoon, we Global Volunteers practiced singing "If I had a Hammer," and virtually reviewed the pattern of dance steps for "Les Saluts," a French-Canadian fiddle tune. Our hope is that the room that Chris is arranging will be of suitable size for all to take part in dancing. At the Ceremony, Chris translated for the Dignitaries. Hu Di did her usual amazing alternation of Chinese and English paragraphs of speech. Each Volunteer briefly expressed his/her appreciation and heartfelt thanks to everyone who organized, sponsored and participated in the program at Kunming Teachers College. Scrolls of fine calligraphy with unique and personalized prose were presented to each Volunteer. The seven classes were prepared to share their talents. Glenda's class (all women), modeled beautiful colorful costumes representing some of the minority peoples of Yunnan. Leon/Kathleen's class told jokes in pairs. John's class sang "I Can Fly," which they had translated into English from the original Chinese. Josh/Carole's class presented a skit about rascals (Jack and Daniel) who went into a French Restaurant. Roles of other diners, waiters and Restaurant Manager were acted by the other students, with roles for Josh and Hu Di's cousin Brent. Rachel/Margaret's class sang Frere Jacques in French, English and Chinese. Rachel had worked hard to change the students' pronunciation to "vous" from "wu." With a yellow paper prop constructed by Margaret and Rachel, the class sang "Yellow Submarine," too. Martin's class sang several songs, with members taking turns as Conductor. Corrine's and my class sang "Blowin' in the Wind," with a harmony part. 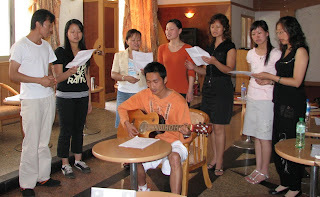 A surprise for the Volunteers was a song about friendship from the students, in Chinese. Then the Volunteers shared their rendition of “If I had a Hammer." They led the folkdance, "Les Saluts," inviting everyone to join the dance in three concentric circles. We parted from the students warmly and regretfully, as it was time to enjoy a last GV dinner together at an attractive restaurant across from Green Lake Park. Tomorrow and Saturday we bid farewell to each other, but it ain't over yet: Hu Di is kindly taking us on an outing to the "Wild Animal Park" of Kunming! Hello, Pandas! Only two days of classes left. All good things must come to an end. Still, now it seems our end is coming too abruptly. What are some of the expected joys I found here in China? First off, I think about our students. In this I can only speak directly of the students of Josh and mine. Our students were enthusiastic, fun, bright, cooperative and fairly proficient in English. It has honestly been fun working with them. It has not been so much a teacher- student situation but more a team approach to the classes. They have been anxious both to share their culture and life stories with us and also to hear about what life is like for an American. Having lived in big cities in America, I’m afraid I have become cynical. When a stranger approaches me on the street, my first reaction is caution that perhaps they want to beg something from me. I’ve learned to walk down the street, taking everything in but appearing to not look at anyone. To be that way here is a grand mistake. More often than not, we receive smiles and friendly gestures on the streets in China. It’s not unusual for children, adults and old people to approach us for the simple purpose of sharing a brief conversation in English. Every time I’ve been on a crowded bus here, someone has jumped up to offer me their seat. Such simple courtesies have been a delight. Another true pleasure has been the Chinese massages. One night we received a pedicure, which in fact, was a foot and leg massage. Lasting for 70 minutes it cost about $10. I thought nothing could be more luxurious, but found that idea contradicted the next day. Josh and I were treated by our students to lunch at a restaurant. You won’t believe it! A massage was included with the meal. For about 15 minutes while we waited for our food, a waitress gave each of us a back massage. A benefit of this trip has been the cultural talks which Hu Di gives us each day. Today’s theme was politics in China. It went like this. The Communist Party of China (CPC) is the founding and ruling party in China and the world’s biggest political party. Its paramount position as the supreme political authority in China is guaranteed by "Constitution of the People's Republic of China" China's constitution and realized through control of all state apparatus. The CPC has both central and local organizations. At the top is the Central Committee and, while when it is not in session, the Political Bureau and its Standing Committee exercise the power of the Central Committee. Both the Political Bureau and its Standing Committee are elected by the plenary session of the Central Committee. The CPC is a unified entity organized according to its program, constitution and the principle of democratic centralism. The Constitution of the Communist Party of China stipulates that any Chinese worker, farmer, member of the armed forces, intellectual and any advanced element of other social strata who has reached the age of 18 and who accepts the program and constitution of the CPC and is willing to join and work in one of the Party organizations, carry out the Party's decisions and pay membership dues regularly may apply for membership in the CPC. The party's 70 million members constitute 5.5% of the total population of China. The CPPCC is an organization of the patriotic united front of the Chinese people. It is an important organization of multi-party cooperation and political consultation under the leadership of the CPC. The organization consists of both Party members and non-Party members, who discuss Chinese communism's principles. The members are chosen by the Communist Party of China, but are from a somewhat broader range of people than normally chosen for government office. It is composed of the CPC, other political parties, mass organizations, different ethnic groups and representative public personages from all walks of life, representatives of compatriots of Taiwan, Hong Kong and Macao as well as of returned overseas Chinese and other specially invited people. The CPPCC typically holds a yearly meeting at the same time as plenary sessions of the National People's Congress (NCP). Both CPPCC and NPC are often called the Lianghui (Two Meetings), making important national level political decisions. In March, the First Session of the 11th National Committee of the Chinese People's Political Consultative Conference (CPPCC), the country's top political advisory body, just took place and lasted 11 days. The National People's Congress, abbreviated NPC, is the highest state body and only legislative house in the People's Republic of China. Although the membership of the NPC is still largely determined by the Communist Party of China, since the early 1990s it has moved away from its previous role as a symbolic but powerless rubber-stamp legislature, and has become a forum for mediating policy differences between different parts of the Party and the government. For the NPC to formally defeat a proposal put before them is a rare, but not non-existent event, and the NPC has been quite active in being the forum in which legislation is debated before being put to a vote. The National People's Congress is held in the Great Hall of the People, Beijing, capital of the People's Republic of China. NCP is held each year along with the People's Political Consultative Conference (CPPCC) whose members are from a broader background. The day ended with a visit to an administrator’s condominium apartment The apartment itself has about 1600 square feet, 3 bedrooms, 2 baths, a large family room, and two balconies and is beautifully decorated in a modern style. Condominiums go for about $100,000, with a monthly maintenance fee of $20. Because of lack of housing in the city of Kunming, a decision was made to build up a “new” city in the outskirts. In the last 3 years 100,000 apartments have been constructed in buildings of about 20 floors each. There appears to have been much planning since there are also parks, shopping centers, underground parking, schools, playgrounds, flowers, trees, etc. It was in the apartment where we practiced making dumplings and spring rolls. I learned that the dipping sauce can include vinegar, soy sauce, hot sauce, cilantro and garlic. We may not be masters at preparing Chinese food, but we have greatly improved our techniques in the use of chopsticks. We’re all looking forward to our final day tomorrow where teachers and students will surprise each other with special activities for the closing ceremony. Thought for the day: Traveler’s Prayer: Lord, put your arm around my shoulder and your hand across my mouth….Amen. As we enter the final week of our service program, I am impressed and pleased by the conviviality and camaraderie of our class members. They have become much more self-confident in their casual conversation, have improved greatly in their public speaking ability, and have increased their English speaking conversational skills. They treat each other as members of an extended family and feel a responsibility to their classmates to support and help each other. Our schedule today includes the usual morning teaching session and then lunch hosted by the students followed by a friendship activity. Lunch is at a charming restaurant near Yunnan University in a private room Aside from an exceptional menu, we have unexpected after lunch entertainment by our student, Andy, who has brought his guitar with him. Andy is a talented composer as well as being a performing artist with vocal and instrumental skills. He entertains us with several of his original compositions which he sings accompanied by his guitar. Several of the women tease him unmercifully about his single marital status which he accepts with good humor. But Andy gives as good as he gets and the lunch turns out to be a festive culinary feast with much frivolity..
We then proceeded to the Kunming train Station to take a train ride around the city but learn to our dismay that the next train is not until 4:30 pm. Plan B is immediately put into effect and we all convoy out to a tea room in the northern part of the city. This tea room is unlike any tea room I have ever been to and is more like a KTV or karaoke room in Kunming. The decor however is out of Somerset Maugham with large fan-shaped wicker back chairs out of the Raffles Hotel in Singapore. Custom brewed teas with snacks are served on low tables and music is supplied by Andy and his friend, Nick, who sing out of songbooks. The rest of the class members and I play a card game which I cannot comprehend other than recognizing some elements of rummy and pinochle. The main goal of the game is to get the loser of each hand to perform a penalty act, mainly singing or dancing, with the aim to humiliate him or her to much laughter and applause. The class enjoys this three ring circus of singing, telling jokes, making fun and humiliating the loser of each hand, drinking tea, eating snacks, and taking endless photos to document the festivities and making fools of one selves. Time flies rapidly before I realize it is 5:30 pm and I play party pooper by making an excuse that I must leave to attend dinner with my fellow Volunteers. The class sends me off by taxi and I assume they will end the festivities shortly but the ultimate test will be to see who shows up in class tomorrow and in what condition. At dinner an informal census reveals that the other Volunteers had a spectacular lunch but Carole and Josh experienced an exceptional predining experience of an upper body massage. Friendship activities included dumpling making, sightseeing, and researching out markets. After dinner the Final Celebration Committee meeting was chaired by Dixie who outlined the proposed agenda including speeches, awarding of the students’ certificates, final words by the Volunteers, performances by each class, and finally a song performed by the Volunteers. The entire group of students and Volunteers would then go to the courtyard to perform a folk dance prior to bidding all farewell. Breakfast was when ever you showed up. Lunch at 12:00 everyone participated. Several hotel staff sang songs to us in appreciation for the English classes we gave them the first week we arrived. The hotel staff had wine in their glasses and we had coke or water. What is wrong with this picture? Hu Di asked for our flight schedules so she could make arrangements for our departure. We also got the rest of the week’s activities. We joined our students for an afternoon session. Then we went directly from school for dinner. We ate at The Kitchen in the Neighbor, which is owned by our spectacular driver Mr. Qi or nickname (Tiger). We wandered into a TCG Nordica which is a gallery/stage/culture education/cafe. We viewed drawings that we could not believe had been drawn by children approximately 5 years old. Had a safe trip to the hotel. Now it is time to check out the 20th floor. Only John goes to the 4th floor for a massage. Photo: (1) Corrine with students in the classroom during the week. (2) Lovers watching boaters on Green Lake. We are the “stay-at-homes”: Kathleen and Martin, Tim, John, Rhonda, Corrine, along with Hu Di and cousin Brent. There was the walking, some shopping. Corrine and John met Mr. Ma at the Sacred Heart Cathedral and visited with Sister Mary Ann who explained much about the status of the Catholic Church in Kunming and in China. On to the Bird and Flower Market for a look. Then the RAIN, the rain – a deluge -- and we hoped it was not raining for our teammates in Lijiang. John and I went to YUNNAN DREAM, the performance at the Yunnan Art Theatre on Saturday evening. It would rival an extravaganza in Las Vegas! The theme was of an American Flying Tiger who had crashed in the mountains, was rescued and hidden by various nationalities. Patrons of the theatre were seated at tables and served tea and fruit. Then the music began. Song and dance, beautiful costumes, people dropping from the ceiling, spectacular lighting effects, acrobats and magic followed. Even a tiger, a horse and birds were part of the program. When the spotlight focused on us and John and I were feted with the ceremonial saucer of wine, we drank with great aplomb and to much applause. Our moment of fame and celebrity had come and soon left. Tim and his wife, Ming, left early on Sunday morning. John and I returned to the church at 9 AM where the congregation sings heartily and prays devoutly as the traditional Mass is celebrated. When leaving we were tapped by a young woman who asked us to join her small group for a discussion. We soon met Sister Margaret and her class of bible students. Sister Margaret is here to open a Catholic Social Services Center for Yunnan Province. She told of her life in Singapore before returning to China. And we learned more about her work here. Paddling and dancing gave real balance to this fine day as Kathleen and Martin went to Green Lake Park and paddled on the lake while Rhonda danced with the senior citizens there. Hu Di treated her cousin, Brent, to pizza for the first time. We await our confreres with their news of Lijiang and its delights. Saturday in Lijiang started off with a free massage on our way to Jade Dragon Snow mountain. In actuality, it was just our bus driving along a bumpy road. As we got higher and higher into the foggy mountains, the temperature started dropping. Driving along, our guide Tina explained the common Naxi family names. Hé, the same name as our driver, is the name of the common people. Mù is another which is of higher status. We also passed a large field and were told it was a natural airport which in World War II was used by the Flying Tigers. After an hour on the road we arrived at the foot of a chairlift going up to 3700 meters. As we avoided piles of yak dung, making our way around yak meadow, we saw the wonders of Shangri-la, as James Hilton described it in the Lost Horizon. We arrived out of breath at the highest point of our journey, the iPhone still able to get service, the tallest mountain jutting up in front of us. After our ears popped once more, Margaret rode a yak, we saw a turquoise river (one of the wonders of Shangri-la), and the rain started. We took a trip to the home of Dr. Rock, an American who left America in the early 20th century to live with the Naxi people. By the time we were done, the rain had begun pouring and we rushed out. We traveled on to a Buddhist temple, which is known for its 1000 flower camellia. Though not in bloom, the tree, actually two trees grafted together, was beautiful and pictures of the two different shades of red flower stunned us all. Afterwards we went to see a fresco which was saved in the Cultural Revolution by having chairman Mao’s picture on top of it. On our way out we bargained with the venders for Batik tablecloths. Dinner was delicious pizza at a restaurant near the hotel, and once we were sated we returned home in the now pounding rain. Sunday morning was spent on our own. Some went shopping in the old city and some went to the Wan Gu Lao pagoda, the tallest wooden pagoda in China. After lunch we went to a Dongba/Naxi museum where we saw pictographs depicting cultural images, a topological map, clothes and other cultural items of the Naxi people including hunting weaponry and their traditional housing. A Dongba in the Naxi culture is the shaman. Still in the museum, we stopped in a shop where there was a living Dongba rewriting the scriptures. Also at the shop they had jewelry, beautiful porcelain, and other such treasures which were for sale from very little to a lot. I bargained my way out of 1400 Yuan on an item that I can’t name in this journal entry. After this we went to the Jade Dragon reflecting pool, inside a beautiful park and took the perfect picture of the water with a bridge and the mountain jutting up in the distance. It was a beautiful day. Perfect for ending our trip to Lijiang. We left Lijiang Sunday night on the shortest flight of my life and returned that night. Thought for the Day: The past is history. The future is a mystery. Today is a gift that’s why it is called a present. Photos for the Day: (1) Glenda gets a surprise birthday cake at breakfast. (2) Naxi Orchestra pi-pa player in Lijiang. Today is the 4th of July and the teams recognition of their homelands National Holiday. Back in the USA many people would be singing “Yankee Doodle Dandy”, eating hot dogs and towards evening watching a display of fireworks; at least this has been my experience in the past. However, this morning, after the team enjoyed their usual fanfare of Asian and Western cuisine at breakfast we had a birthday cake and song.. Yes, today is my birthday. A special thank you to Hu Di and others who made this a special beginning to the day for me. After breakfast we all departed for our morning teaching assignments. Two members of our team, Rhonda and Tim, are finishing their 2 week teaching assignment so farewells were in order in their clasrooms and beyond. In my classroom, the students had discovered it was my birthday and rushed out to purchase a cake….so round 2 of a celebration took place. Wow…what a morning! After lunch at the hotel, we all scattered in different directions to begin our weekend adventures, Margaret, Carole, Dixie, Leon, Rachel, Joshua and I headed for the Kunming airport for our flight to Lijiang. Upon arrival in Lijiang, we were greeted by our guide, Wang Li Mei or her English name Tina. In route to the Grand Hotel, Tina informed us about the city of 100,000 mostly Naxi people. Li Jiang means “Beautiful River.” It’s a World Heritage Site with old wooden and stone buildings, cobbled stone streets and streams with willow trees. At an elevation of 2400 m or approx. 7,200 feet, the city is quite charming. Tina also informed us that Lijiang is a “paradise for men.” The women do all the house and farm work while the men participate in playing music, chess, drawing pictures, drinking tea, smoking and drinking alcohol. After arriving at our hotel we went to dine at a French Restaurant on bar street. It was a very colorful area in the old city. We concluded our evening at the Naxi Concert Hall for a superb performance by the Naxi Orchestra. They played ancient music dating back to the Song and Tang Dynasties. All in all ….a delightful day. Thought for the day: Teamwork means never having to take all the blame yourself. Photo for the day: Rachel in her classroom. Today began with our regular breakfast with Yoyo translating our egg orders to the egg chef, and Hu Di giving us our bit of Chinese culture. Today we heard about two more festivals, the Double 9 (9/9) festival, and the Moon Festival. Hu Di gave the routine announcements where we found out that as the day progressed we would be joined by Tim’s wife, and Hu Di’s cousin. We then headed off for our usual teaching morning. As everyday, after we taught four classes, we returned to the hotel for lunch where we met Hu Di’s cousin, Brent. In the afternoon, ll of us, Brent included, went back to the school where we were to hear speeches from 21 of the selected students, three from each class. The speeches were all very well done. All had a wide variety of topics ranging from dolphins to colors. After hearing all 21 of the speeches, we walked to a restaurant called the Golden Flower Hot Pot, where each of us enjoyed a steaming pot of spicy, non-spicy, sour, or coconut broth to which we added various meats and veggies. Towards the end of the meal, we were joined by Tim’s wife, Ren Ning, and then walked back to the school where we met up with our driver who took us back to the hotel for the night. Photos for the day: (1) Joshua and some wet students with Leon in the background at Hump Memorial Park. (2) Rachel and her hairdressers. Last night brought a thunderstorm that woke many of us up at 3 AM. In the morning there was a flood in the street in front of our hotel that appeared to be about 2 feet deep. Traffic was still passing and for reasons I don't understand, no vehicles stalled out. Hu Di continued her discussion of Chinese traditional festivals with The Dragon Boat Festival (Duanwu Festival or Double 5th Festival) and the Double Seven Festival. I particularly enjoyed the bitter-sweet love story behind The Double Seven Festival which is the Chinese Valentine's Day. We suggested to Hu Di that she look out of the restaurant window and view the condition of the street. She did, with an exclamation of surprise. Then, after carefully studying the street and the sky, she gave us the weather forecast for the day: rain. The flooding caused us to arrive about 15 minutes late for our eighth teaching day at Kunming Teachers' College. Kathleen and I arrived at our classroom to find only five of our eleven students. The rest were delayed by the flooding. During the morning all but one of our missing students straggled in. The most interesting story was told by Eileen who arrived two hours late to class: her children had to row her across the flood so she could reach transportation to the school. I later heard stories from other volunteers of students who walked in the rain for two hours in order to catch at least the last half hour of class. What amazing behavior! It is no wonder China's economy is growing so quickly. Our group of four (Dixie and I and our two grandchildren, Joshua and Rachel) had planned to spend the afternoon at the Wild Animal Zoo, but the rain washed out that plan. So, Dixie and Rachel decided to try out one of the local beauty shops where Dixie got her hair cut and Rachel got xxxxxxxxxx (censored to prevent her parents from knowing) xxxxxxxxxxxx which looks astonishing. Joshua, meanwhile, spent the afternoon in the company of Bird and his girl friend, who both work in restaurants at the hotel. They played ping pong, showed Joshua how to make tea and watched videos. We ate dinner at a neighborhood restaurant and then met with Mr. Ma (our Kunming tour operator) who collected the money for this weekend's trip to Lijiang which he carried away in his wheelbarrow. In the evening our family group of four went with Bird and his girl friend to a KTV called Windsor. This was our first visit to a Karaoke establishment. There was more chrome and marble in the building than in an entire Trump casino. We chose songs (yes, there were some in English from 45 years ago) from a computer screen and were handed microphones. The visuals behind the Singer were cinema graphic, without the dancing that we associate with MTV in the States. Between songs the big screen showed liquor commercials. The party room held a whole group of Bird's colleagues including his Manager. They were most hospitable but probably thought we were a bit strange when they discovered that our only drink was tonic water. It turns out that the Manager hails from Lijiang and, when we told her that we would be touring her home town this weekend she sang a number of songs for us, a cappella, in the Dongba language. When we took our leave at 10 PM the party was still in full swing and looked like it could go on 'till dawn. We were pleased to have been able to take part in another special experience in China. Thought for the Day: If you think you are too small to be effective, you have never been in bed with a mosquito. Photo for the Day: Rhonda and John with one of their students. It seems that every culture and religion aerates rituals many in the form of celebrations, holidays or festivals, I think it is a common way we have of recognizing a season, a new beginning, an ending or passing. Today, Hu Di spoke to us of 2 important Chinese festivals: The Spring Festival, Guo Nian, and the Pure Festival, Quing Ming , I think Guo Nian is like New Year in America. It is a true when the Chinese "get over the year", leave the bad behind. There is all sorts of customs, or we may them superstitions. For the 1st 3days, no one is to take medicine or bad luck will come in the year. Also, kids must not say 'death' and no one is to throw any garbage away because that would be like throwing away Prosperity and Fortunately. There is a term limit to this. The real Spring Festival however is Qing Ming, students take off from school to sweep the ancestor's tombs. Relatives also burn paper money at graves so their ancestors have money to spend. I like that to take time to honor and remember who came before us and give the youngsters an opportunity to connect with the past , which is something we seem to separate more in America. This is my second time as Global Volunteer and third time to teach in China. As usual, when entering the classroom, I learn more from the students about what they have overcome just to get here. I hear their stories and their speeches for our Global Volunteers newer ritual, "The Speech Festival". Perhaps someday our teacher-student children will participate in this newest celebration ¦and perhaps our children will want to celebrate with them! Xie Xie. Thought for the Day: eat less, exercise more, and drinks lots of liquid. Photos for the Day: 1) Kathleen is shining her students' faces with beautiful smiles, taken in a field trip. 2)"We are good helpers". taken at a local wholesale flower market. I started my daily routine getting up before sunrise, showering, taking my medications, and doing some lesson planning. While martin was getting his act together, I went to the western restaurant about 6:30 where I met the other charter member of the early risers club, Corrine McCarthy, we are occasionally joined by the third member of the club, John Doty. All of us spent this pleasant time chatting about anything or everything. A side benefit of the early risers club is that Bird, the hotel staff member in charge of the coffee bar, made a freshly brewed pot of coffee for the three of us. By seven o'clock we were joined by the rest of the team for breakfast. John read his journal entry followed by my thought of the day. An educational lecture about population changes in china was given by Hu Di. I thought it was interesting that 147 million Chinese are constantly moving, working in areas different from their official residence. After breakfast 9 Global Vlunteers took a field trip led by Chris Li to the Dounan wholesale flower market in the new Kunming area. Besides seeing all the beautiful cut flowers and plants for the region, the volunteers interacted with many local citizens. I especially enjoyed meeting and playing with the young babies in the market, buying flowers and souvenirs. Then the group returned to the hotel for a short break before an enjoyable non-spicy lunch. Our teaching session today was in the afternoon. Leon and I continued our usual lesson plans but discussed the major change of the speech festival scheduled for Thursday afternoon our students were little anxious because they realized that they would have to work hard but they also realized that the volunteers would also work hard to get them ready for the festival. After the teaching session, the team went directly to the 1915 restaurant, a restaurant of historical significance, where we enjoyed a mildly spicy dinner. I was happy to return to the hotel for some personal time before going to sleep. But only for a hour. So Eden goes down to day. Photos for the Day: 1) John is saying with his dear students and teaching partner Rhonda. 2) Peacock dance at Dynamic Yunnan, a local primitive performance show. MDG #2: Achieve universal primary education: -helped 68 Chinese English teachers with their conversational English skills – providing 260 hours in classroom teaching plus 260 hours of lesson prep time. Today was restful although the weather warmed up yesterday and remained so today according to Dixie’s weather report, the temperature was over 80 F. This morning, Corrine, Margaret, Glenda, Tim and I walked to a Catholic Church mass conducted by the Bishop. The ritual was familiar: two readings from the Bible, either old or new testaments, a gospel’s reading followed by a sermon, which proved to be long. There were incense, music, and singing. We recognized melodies of Beethoven’s “Ode to Joy”, “Be Loving in the Wind” and “What a Friend We Have in Jesus”. There was no wine served at communion and no collection. A small child across from us played while adults tried to keep her content. Of course, all words were in Chinese. At breakfast, martin described his “purchase” (not thought) of the day, a tote bag that folds into a small item. At dinner of the day, Kathleen informed us of the “Flying Tigers” of WWII here in Kunming. Hu Di and Glenda visited with a former global volunteer teacher who has been teaching here for one year. Corrine continued her reunion with the esteemed Mr. Ma. Joshua, after giving me a computer lesson, played with Bird ( a hotel western restaurant waiter). Tim, Rhonda, Margaret and Carole went by taxi to the Yunnan Nationalities Village. Leon abd Dixie found time to enjoy Green Lake Park. At dinner, we heard two journals, Corrine from Friday and Dixie from Saturday. Then we were off to Dynamic Yunnan, a performance of primitive minorities groups with dramatic use lighting, sound, dance, music, and song, culminating with a spectacular peacock dance. The image reflected the role ritual, tradition and beauty playing in a culture.